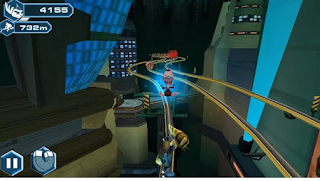 Ratchet & Clark Before the Nexus is an endless running game, very similar with Subway Surfers game. Swipe Up and Hold the screen: Jump and followed by air gliding. These are the "missions" in the game. When you finish a skill points, you will earn hero bolt and coin bolts. Coin bolts is your currency in the game while hero bolts are only use to revive your character. Gadgets: Unlock them all first before you upgrade any of them. The more gadgets unlocked, the more different gadget will spawn. Armor: Same as weapons, you should buy the nexus armor only because you can't upgrade or sell your older armors. Always stay on the middle lane if there is no bolt yet or no obstacle in the middle lane. The middle lane are more safer than the right or left lane because while you are on the left or right lane, your only option to transfer is only at the middle when there will be a obstacle on your current lane. Jump or swipe up is only advisable if your all of the lanes have currently obstacles. Always prioritize those flying enemies because their attacks are ground based. Same as endless running guide, you should stay at the middle lane for safety purposes. To avoid ground based attacks, you should either transfer to a safer lane or you can jump. Powerful weapons are the best option to take down bosses.